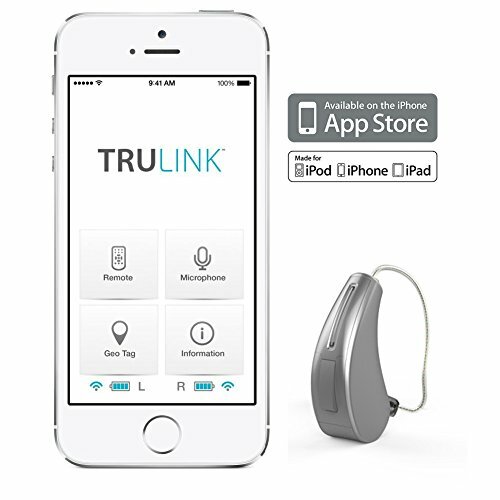 Control your hearing experiences with Halo2, the breakthrough Made for iPhone Hearing Aid amplifier, and TruLink, Starkey's personalized hearing control app. Halo hearing aid amplifiers are engineered to work with your iPhone, iPad and iPod touch, so FaceTime and phone calls, music, videos and more stream directly into your hearing aids amplifier with pristine sound quality no background buzzing and whistling.The Starkey Halo2 i2400 is arguably the best Made for iPhone hearing aid amplifier on the market right now. This amplifier can be paired with an iPhone and controlled via the TruLink app which allows for unprecedented user control of the aids, streaming of phone calls, music, and more, and a myriad of other features. "According to the FDA, it is in your best health interest to obtain a professional medical evaluation before purchasing a hearing aid and you are encouraged to do so before bidding on this item. If you choose to not obtain a medical evaluation before purchasing this item, I am required by law to provide to you and obtain from you a signed written waiver of the medical evaluation, and I am required to provide to you a copy of the User Instruction Brochure for a hearing aid, review the contents of that brochure with you, and afford you time to read the brochure. You must provide to me either a signed statement from a physician or a signed waiver before I will deliver this item to you. Upon your request, I will also provide to you a copy of the User Instructional Brochure for the hearing aid or the name and address of the manufacturer or distributor from whom a User Instructional Brochure for the hearing aid can be obtained."